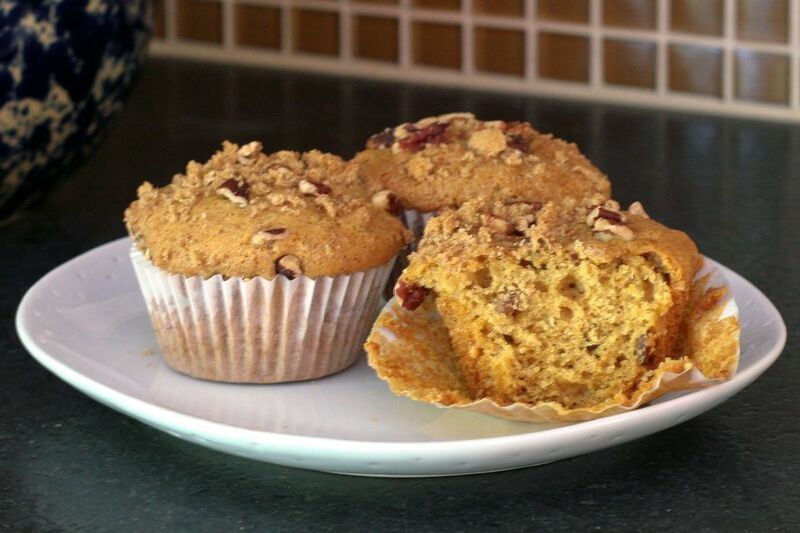 Pumpkin butter and pecans make an extra-special muffin, perfect for fall and winter brunches and holiday parties. Grease and flour muffin pans or line with muffin/cupcake papers. Heat oven to 325°. In a large bowl, combine the sugar, flour, soda, baking powder, salt, nutmeg, and 1 1/2 teaspoons of the cinnamon. In a small bowl, whisk together the eggs, pumpkin butter, canola oil, milk or half-and-half, and vanilla. Add to the dry ingredients, stirring until well blended. Stir in 3/4 cup of the chopped pecans. Fill muffin cups about 2/3 full. Combine the remaining 1/4 cup of pecans with the remaining 1/2 teaspoon cinnamon and 1/4 cup brown sugar. Sprinkle a little over each muffin. Bake for about 30 minutes, until muffins spring back when lightly touched with a finger.